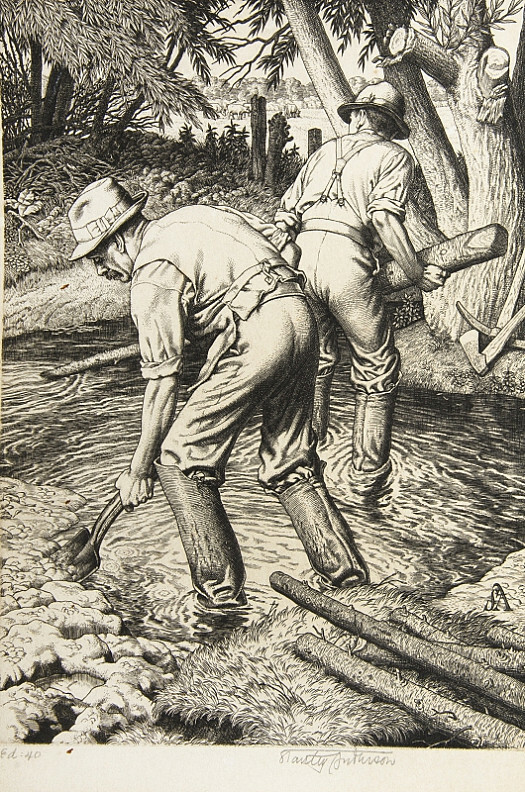 The printmaker and painter, Stanley Anderson, was a major figure in the revival of line engraving between the wars. If his long career allowed for a diverse range of subjects, his skill was displayed particularly well in a series of prints of farm workers and rural craftsmen. Stanley Anderson was born at 11 North Road, Bristol, on 11 May 1884, the son of the general and heraldic engraver, Alfred Ernest Anderson, and his wife, Emma Bessie (née Mitchell). He had a twin sister, Rosa, and a younger sister, Irene. Anderson attended the Merchant Venturers’ Technical College, Bristol, and, while there, determined to become an artist. Somewhat against his will, he became apprenticed to his father at the age of 15 but, as a result, learned the founding skill of his art: engraving on metal with precision. Out of the meagre earnings of an apprentice, he paid to attend a weekly evening class at Bristol Municipal School of Art, and study under its Principal, the painter-engraver, Reginald Bush. In 1907, he also joined the Bristol Savages, a club for artists, writers and musicians that included Bush among its members. Two years later, in 1909, Anderson won the British Institution’s open etching scholarship of £50 a year, on his second attempt. This enabled him to leave Bristol for London, and study for two years at the Royal College of Art, where he received expert instruction in etching and drypoint from Frank Short. He also frequented the print rooms of the British Museum and the Victoria and Albert Museum in order to examine the work of great printmakers, from Dürer to Whistler. He exhibited the first two of 214 works at the Royal Academy in 1909, and became an associate of the Royal Society of Painter-Etchers and Engravers in 1910, when Frank Short became its President. Once his scholarship at the RCA had come to an end, in 1911, he attended evening classes in etching at Goldsmith’s College School of Art, New Cross, under William Lee-Hankey. On 10 August 1910, Anderson married Lilian Phelps, a nurse at St Thomas’s Hospital, and they settled in Brentham Garden Suburb, in Ealing. They would have two sons, Ivan (1911-1995) and Maxim (1914-1959), the younger of whom would become a documentary filmmaker. A combination of his own dedication and the practical support of Lilian helped Anderson provide for his family while he attempted to establish himself as an artist. Despite financial uncertainty at this time, he made two trips to France, in 1911 and 1914. When war broke out, Anderson was rejected as unfit for service, and instead engaged in munitions work at Woolwich, while living with his family in nearby Eltham. He felt anger about the conflict, which he expressed in a series of watercolour caricatures. At the end of the war, the family moved to Chelsea, where Anderson had lodged while he was a student. 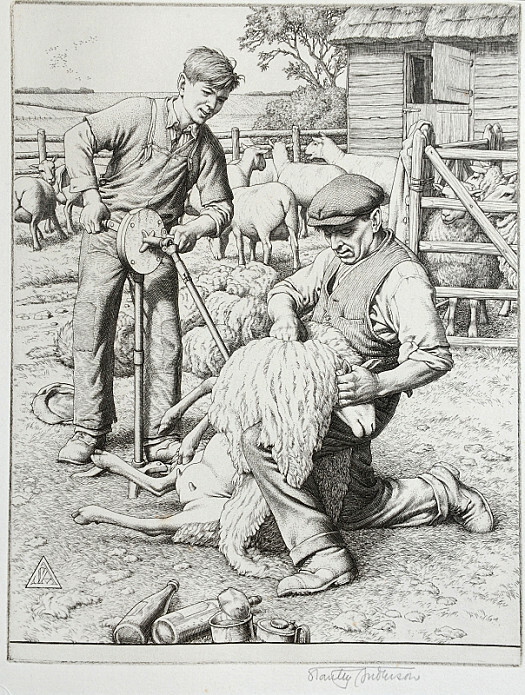 Drawing on the inspiration of Muirhead Bone, Francis Dodd and William Strang, he focussed mainly on views of London and portraits, and slowly began to gain a reputation as a printmaker that could be compared to that of Gerald Brockhurst, Malcolm Osborne and Henry Rushbury. Between 1919 and 1922, Henry Graves & Co published a series of 18 topographical etchings and, though he considered these to be examples of ‘hack work’, travel at home (and later abroad) helped him to broaden his range. The commercial success of these projects also gave him sufficient security to pursue his own preference for figure subjects, as a painter in tempera as well as a printmaker. He received official recognition in 1923 when he was elected a full member of the Royal Society of Painter-Etchers and Engravers. 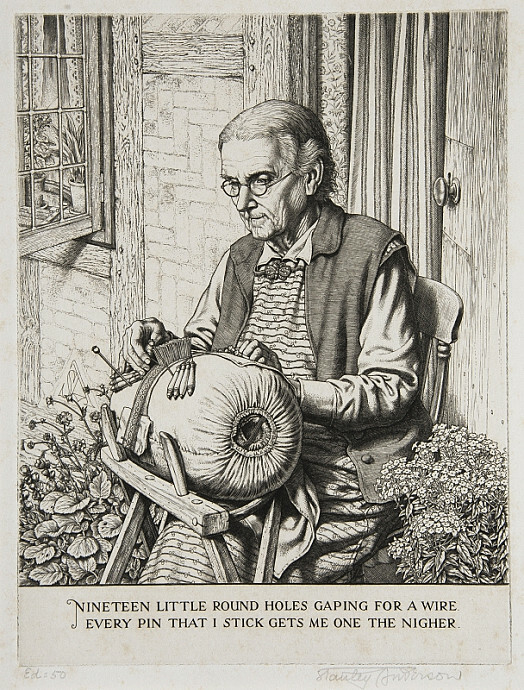 In 1925, Anderson succeeded Malcolm Osborne as visiting instructor in the etching department of Goldsmiths’ College School of Art, and remained on its staff until 1940, also teaching wood-engraving. In addition, he was a member of the engraving faculty of the British School in Rome between 1930 and 1952. Further recognition came when he was elected as a Royal Academician (ARA 1934, RA 1941) and chosen as the sole representative of British line engraving at the 1938 Venice Biennale. 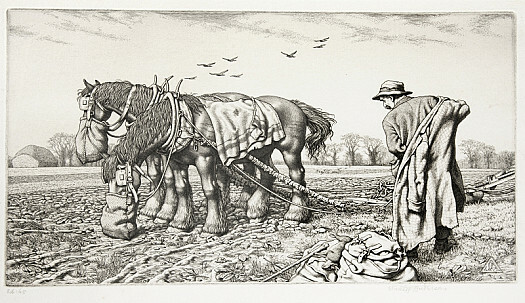 From 1929, Anderson had turned increasingly to line engraving, and he worked exclusively in the medium from 1934, showcasing his mastery of it in a long, substantial, and now famous, series on the theme of rural crafts, labour and trade. This was founded on the rural experience that he gained from 1933, when he bought the cottage of Old Timbers in Towersey, a small village in Oxfordshire. He and his wife settled there permanently in 1941, after his London home and studio were destroyed in an air raid. He further developed his interest in rural life in the 25 watercolours of Gloucestershire and Oxfordshire that he produced for Sir Kenneth Clark’s Recording Britain project, and in other paintings. Appointed a Commander of the Order of the British Empire in 1951, he ceased working two years later when he developed neuritis in his right hand. In his last years, Anderson lived at Darobey, Church Lane, Chearsley, Buckinghamshire, dying there on 4 March 1966. His work is represented in numerous public collections, including the British Museum and the V&A; and the Ashmolean Museum (Oxford) and The Fitzwilliam Museum (Cambridge).